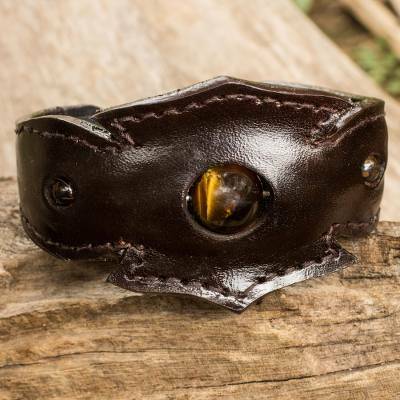 Men's Leather Cuff Bracelet Accented with Tiger's Eye, "Fierce"
Thai artisan Chaloemphon creates a men's cuff bracelet with animal magnetism. Rich brown leather is set with three genuine tiger's eye stones that glow with amber light. The bracelet features an inner structure of stainless steel that allows the cuff to be adjusted for an ideal fit. You can find men's tiger's eye leather cuff bracelet 'Fierce' by Chaloemphon in jewelry categories such as Tigers Eye Bracelets, Leather Bracelets, Stainless Steel Bracelets and Cuff Bracelets. Enjoy exploring these sections for other Novica treasures.